Set to launch this autumn, Nissan’s latest Pulsar offering is creating a real buzz with industry experts. 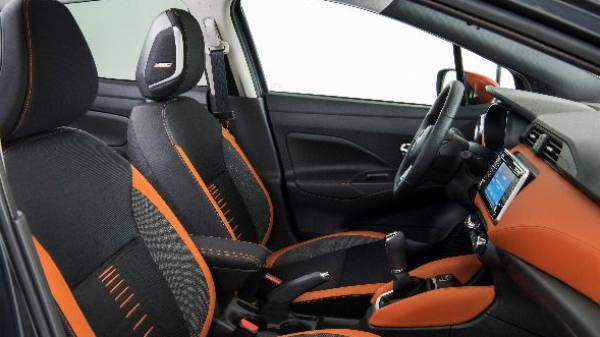 Aiming to bring their passion for technical innovation and design flair to an even larger audience, Nissan have blended a spacious interior with an eye catching shape, using strong lines for an all-round athletic form. Powered by an efficient turbocharged engine, what do we think? Focused on delivering industry-leading comfort and intelligent technology, the interior is deceptively spacious, benefiting from a longer than ever wheel base. Space is central to what Nissan is targeting with the Pulsar and the boot is no exception, combining a substantial capacity of 385 litres with a wide loading aperture, extendable to 1395 litres when folding the rear seats. Leg and shoulder room is category defying and offers more than other leading rivals, with an overall compact shape retaining easy manoeuvrability for parking and control. The exterior is instantly recognisable due to the signature V-motion grille and trademark headlamps, combined with bold curves that reflect the powerful performance delivered from the engine within. Achieving a high torque output (190Nm), quick acceleration and responsive in-gear flexibility, the petrol 1.2 DIG-T is capable of reaching 0-62 in just under 11 seconds, sharp for the class. Considering fuel efficiency, consumption is handy at 56.5 MPG with carbon output kind to the environment, hitting only 117g/km. Technology wise most of the features are new to the sector, including Moving Object Detection and Forward Emergency Braking, improving overall handling, performance and setting new standards for safety. Breaking the premium barrier, the Pulsar includes features previously only offered in high-end vehicles, with the “infortainment” system offering the latest generation “Nissan Connect” dash controls. From a safety perspective, the award winning Nissan Safety Shield neutralises external motoring threats in the surrounding environment through using preventive, appearance and imminent crash technologies in the form of the Around View Monitor, Lane Departure Warning and ABS. All these help to improve visibility, assist the driver in managing their road environment and ultimately minimise damage. Offering all the familiar Nissan qualities in a stylish package, the Pulsar is set to be a huge success. Intrigued? Get a slice of the action & book a test drive ready for its launch at Howards Nissan.